Creating allegories of natural and spiritual worlds, these drawings defy classification. While they relate closely to contemporary maps and seacharts, religious iconography, medical illustration, and cosmological diagrams, Opicinus's drawings cannot be assimilated to any of these categories. In seeking to visualize the possibilities raised by an entire new way of looking at the world they remain sui generis and a formidable challenge to interpretation. In their beautiful strangeness they complicate many of our most fundamental assumptions about medieval visual culture, even as they help us grasp some of its most basic operations. Body-Worlds demonstrates the ways that Opicinus's images spark multiple lines of inquiry, for both the medieval viewer and the modern scholar, into the interplay of religion and science, the practice of experimentation, the operations of allegory in the fourteenth century, and ultimately into the status of representation itself. The multiplication of meaning in these drawings is reflected in the book's structure and methodology: it examines Opicinus's imaginary both in relation to medieval forms of knowing and in light of modern theories; at the same time, it remains unwavering in its focus on the visual logic that connects these variegated drawings but also allows them their stubborn individuality and otherness. Body-Worlds is the inaugural volume of Text Image Context: Studies in Medieval Manuscript Illumination, edited by Jeffrey F. Hamburger, Harvard University. Karl Whittington is an assistant professor in the Department of History of Art at The Ohio State University. 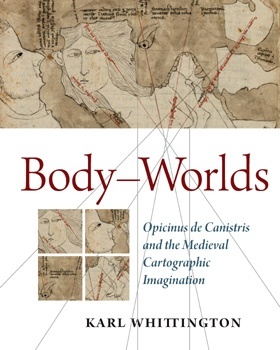 His research and teaching interests include medieval theories of vision and the image, the pictorial mechanics of Trecento painting, medieval medical and scientific imagery, and representations of the body in the Middle Ages. The author of articles on the “psalter map,” on the “cruciform womb,” and on Casper David Friedrich, he has contributed catalogue essays for various exhibitions and to Material Collective, an online forum devoted to visual and material culture. The recipient of a Meiss/Mellon Author's Book Award from the College Art Association and an ICMA–Samuel H. Kress Research Award from the International Center of Medieval Art, he has lectured widely and was a visiting fellow at Kunsthistorisches Institut in Florenz in 2009.